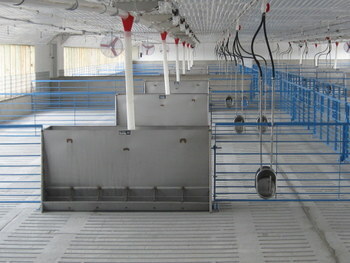 Feeder proportions are optimum dimensions for pigs 17 days old to finishing weight. 4-1/2” high trough eases access to feed. 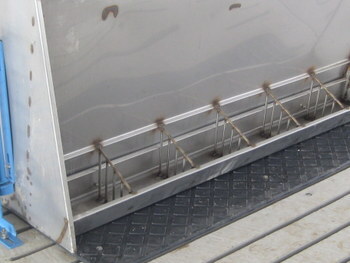 12” spacing of feed holes allows easy feeding access, but keeps younger pigs from lying in feed trough. 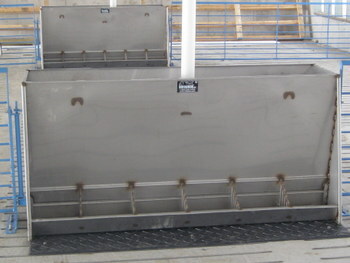 Two divider options put less stress on pigs by eliminating competition for space at the feeder. 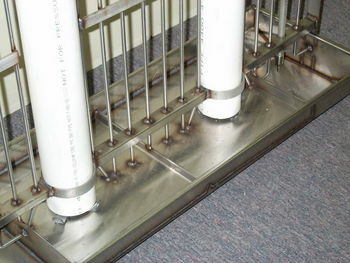 Stainless steel rods and solid stainless dividers. 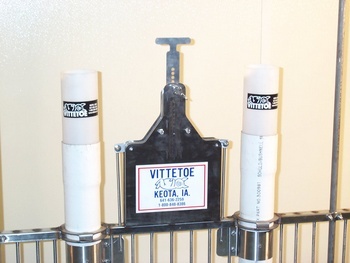 Simple to operate top crank-style feed adjustment slides eliminate feed waste by funneling feed to feed holes. When estimating size of feeder needed to handle pen capacity, figure 5 - 8 pigs per hole. Top and bottom lip on adjustable feed slide agitates feed and prevents clogged feeders. 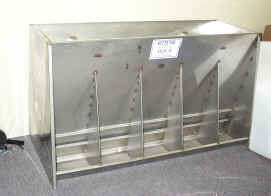 The construction of durable 18-gauge 304 stainless steel on the feeder body aids in ease of cleaning and reduces risk of disease due to stagnant feed. Available in double and single-sided styles. 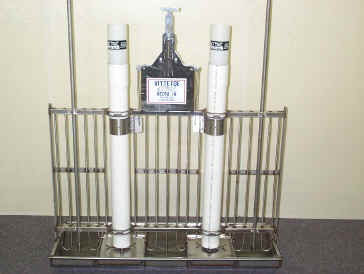 Available in several different lengths to fit any size operation. Wide 12" feed holes encourage easy feeding access, and put less stress on hogs by reducing the need to fight for space at the feeder. 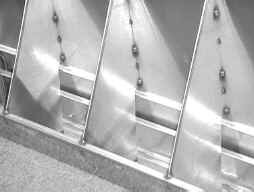 Simple to operate top crank style feed adjustment slides eliminate feed waste by funneling feed to feed holes. 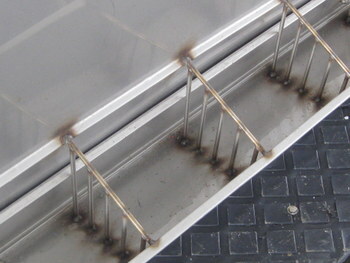 The construction of durable 18 gauge 304 stainless steel on the feeder body aids in ease of cleaning and reduces risk of disease due to stagnant feed. 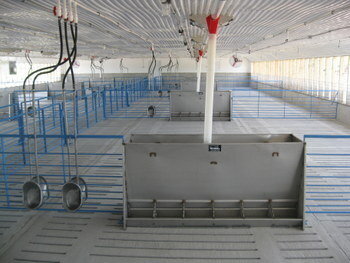 Figure 5 pigs per hole when estimating size of feeder to handle pen capacity.